Where do I get my dog tested? 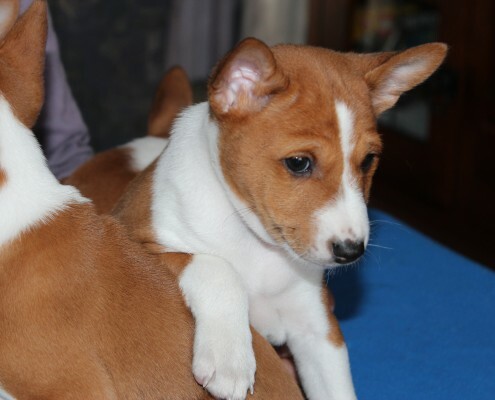 If you are looking for a Basenji puppy this page explains a little about my forthcoming litters. Willow and Breaker make for an interesting combination. They compliment each other’s virtues and where Willow is lacking Breaker makes up for and vice versa. Both Willow and Breaker will have fully completed health tests, including hip analysis and eye screening before they are bred. This will be an exciting litter and I thank Breakers owner for the opportunity of using this handsome young dog. Willow was, until Lyra came along, the baby of the house along with her brother Arthur. Willow has all the usual Basenji traits. She is exuberant and is always seeking my attention. 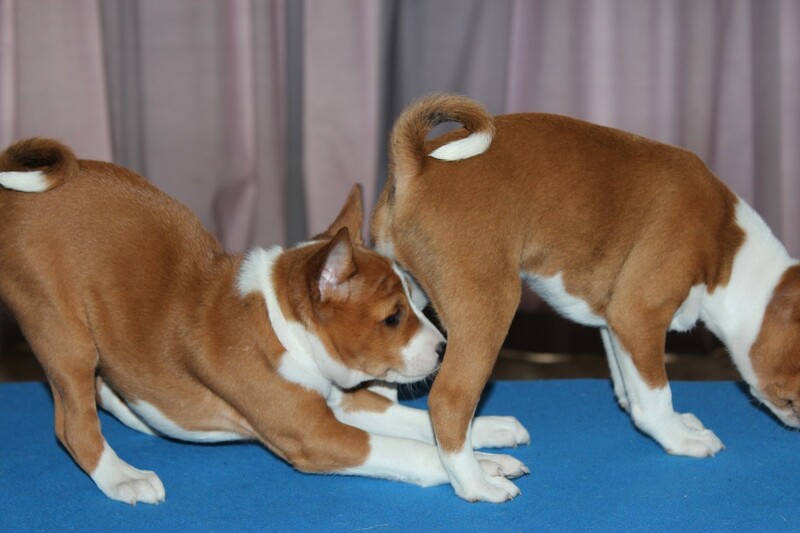 Although, most of my Basenjis are tail waggers, Willow is the tail wagger extraordinaire. Whether you are a new person who she has not met before or an old friend she will greet you with a ‘propeller’ tail. Willow has been a consistent winner in the show ring with many Best of Breeds and a Runner Up in Group to her credit.This will be Willow’s first litter. PennHIP: DI: Right = 0.29 Left 0.29 in tightest 5% for breed. Breed average DI 0.46. Cataracts: Red, carries tan points. Breaker is a recent import to Australia and resides at Zandeena Basenjis, in NSW. 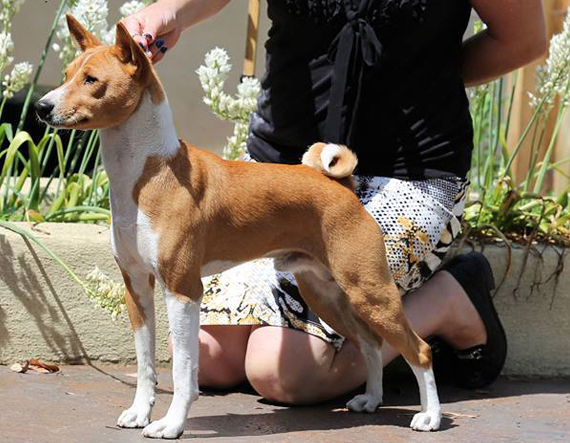 He comes from Carol Webb’s well regarded Kazor Kennels, USA, a kennel that has bred quality Basenjis for many years. Before moving to Australia Breaker obtained his American Grand Champion title. He is also a Best in Speciality Show winner. On his first show outing in Australia, Breaker was awarded Best Exhibit in Group. Since then he has been awarded several more Best of Breed and class in group awards. He has an exceptional temperament to go with his good looks. PennHIP: DI: Right = 0.60 Left 0.50 in central 90% range for the breed. Breed average DI 0.46. Colour: Red, carries tan points. Interested to know more about this and future litters? My 2017 litter is sold – to enquire below about my 2018 litter…. Careful consideration to the dog breed suitable for your lifestyle is critical when deciding which breed will make the best companion for your family. 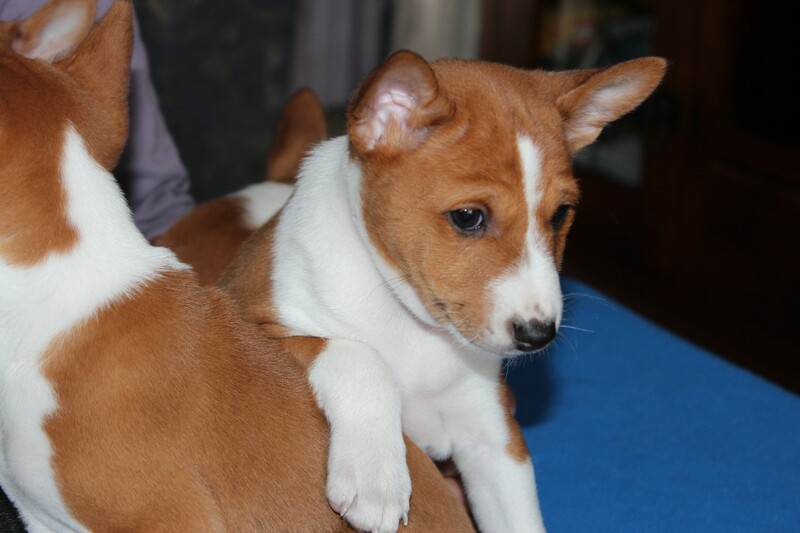 Puppy purchasers should be aware that Basenji puppies will normally go on to live 12-16 years. Good nutrition and veterinary care, especially in old age can be expensive. All dog owners have an obligation for responsible dog ownership. Contract of sale: signed by all parties. The contract is designed to protect the puppy in all instances. Certain assurances are outlined in this document. Any special conditions of sale will be noted in the contract. Puppies sold as companions are sold on a de-sexing contract. 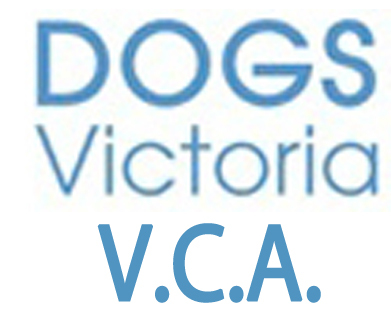 1 year membership of the Victorian Basenji Breed Association Inc. Lifetime return: if for whatever reason a puppy is no longer wanted Tambuzi will take the puppy back at any time. Lifetime support: questions, problems and issues are diligently answered. Assistance with any problem no matter how small for the dogs life. There are many factors for consideration when selecting prospects for the sire (Father) and dam (Mother) of any litter including the health, temperament, conformation and zygosity of the parents. Obviously, we cannot control what nature produces but by testing, research and analysis we can endeavour to reach outcomes to benefit the breed and owners alike. 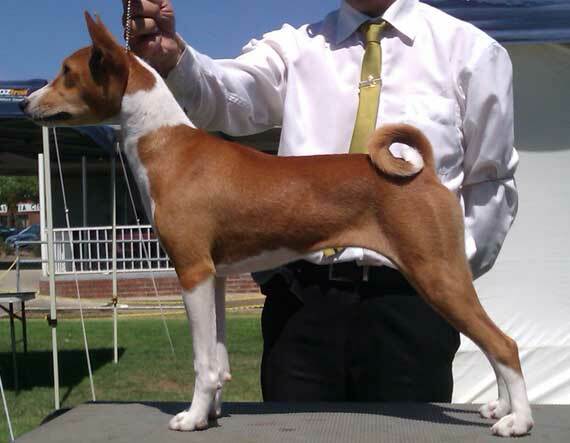 To that end Tambuzi’s primary goal is to produce sound Basenjis; sound in both conformation and temperament. Dog sports such as showing, obedience, agility, tracking etc. 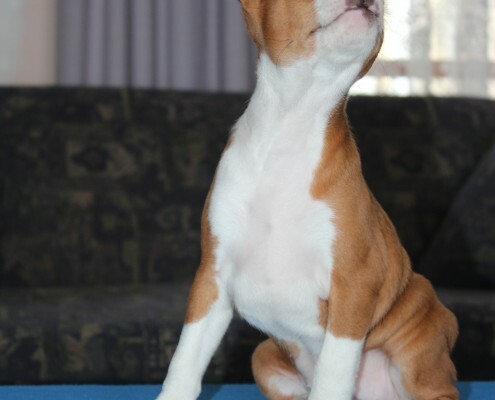 can be exciting and entertaining (for Basenji and human). However, I realise that, in reality, most puppies will become faithful companions and will not necessarily take part in these sporting activities. Deciding on a breeding is done carefully, generally I will not breed until I require a puppy to continue my breeding program and not until I have sufficient enquiries to furnish the puppies with the very best homes. The photos opposite are of the Tambuzi 2013 litter. The advent of affordable DNA testing for health and disease control has made consideration to health, when selecting breeding pairs, much easier to determine. I have an extensive health management program which dictates what is acceptable to breed with and what is not. Nowadays there are many tools available to breeders; DNA testing for disease, DNA analysis of zygosity and various health screening programs. 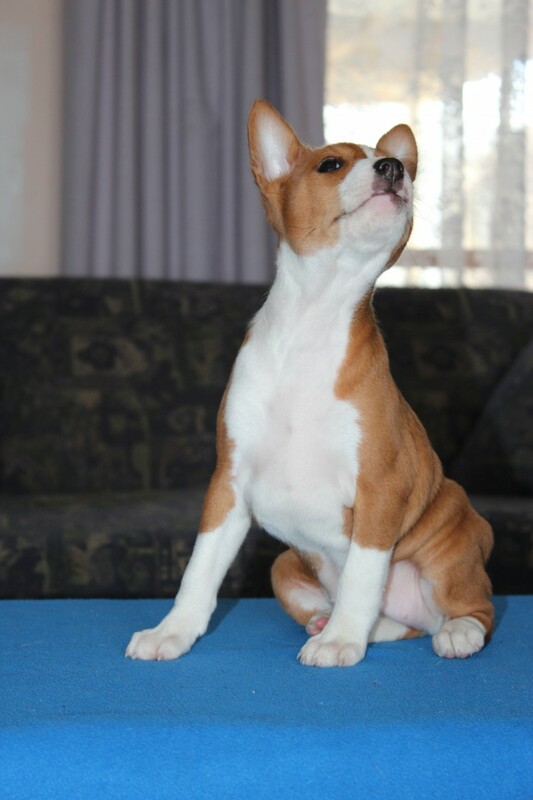 The Basenji is a fairly resilient breed. However, the breed, like most other dog breeds, does have some health challenges. The good news is that with use of a number of health screening ‘tools’ breeders can eliminate disease. Pyruvate Kinase Deficiency (Haemolytic Anaemia) is one example where testing has virtually eliminated the disease. The very quick reduction in the prospect of Basenjis succumbing to Fanconi Syndrome is a direct result of the DNA test now available. 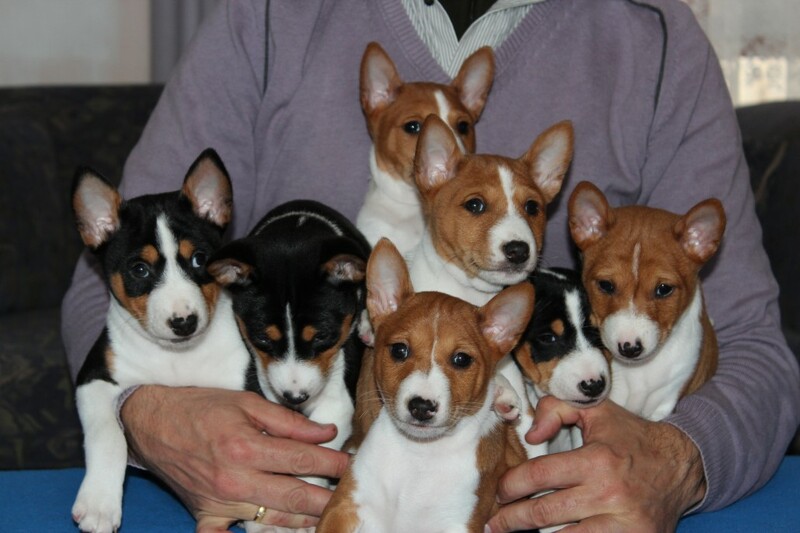 Normal or carrier for Fanconi Syndrome; the puppies might inherit one copy of the mutant gene responsible for the disease if the chosen sire is a carrier. Those that inherit one copy of the mutant gene are known as carriers. Carriers do not become clinically affected. Carriers can and if they are of breeding quality should be bred from to maintain genetic diversity. Normal for Pyruvate Kinase Deficiency; the puppies will not inherit the mutant gene responsible for the disease and therefore, the disease will not be inherited. 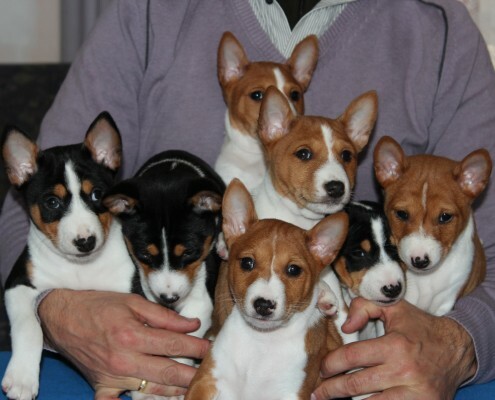 Normal or Carrier for PRA-BJ1 – Basenji Night Blindness; the puppies might inherit one copy of the mutant gene. Those that inherit one copy of the mutant gene are known as carriers. Carriers do not become clinically affected. Carriers can and if they are of breeding quality should be bred from to maintain genetic diversity. What is ‘Normal by Parentage History’ ? Both parents must be normal and in the case of Fanconi Syndrome this must be by the ‘direct test’. Normal by the linkage marker test resulting in a probable result (‘probable normal/clear’) cannot be used in a ‘clear by parentage’ scenario. The word probable is indicative of the fact that the linkage marker test does not test for the precise mutant gene responsible for a condition. Linkage marker tests invariably give inaccurate results. 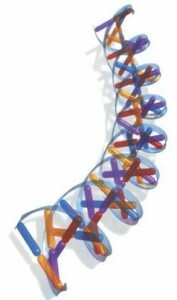 Both parents must be DNA profiled (DNA fingerprint) – the DNA certificates should be available for buyers to review. The dog in questions’ parentage must be proven by DNA. Research by the American Kennel Club found that (across all breeds) 10% of sires were not the sires of the dog in question noted on pedigree documentation; often a non-witnessed mating with another dog had taken place either before or after the desired mating was witnessed. In the case of Normal by Parentage History, the verification of parentage certificate should be available for puppy buyers to view. Why is knowing the parentage important to me, my puppy is a companion, I am not going to breed? In short, accidental matings unbeknown to the owner can and do take place. This means that it is possible for a litter to be sired by a dog other than the one intended by the breeder. This unwitnessed mating might be one that is most undesirable for the health outcomes for the puppies. A female may also be mated by multiple sires and successfully deliver puppies sired from such a multiple mating. 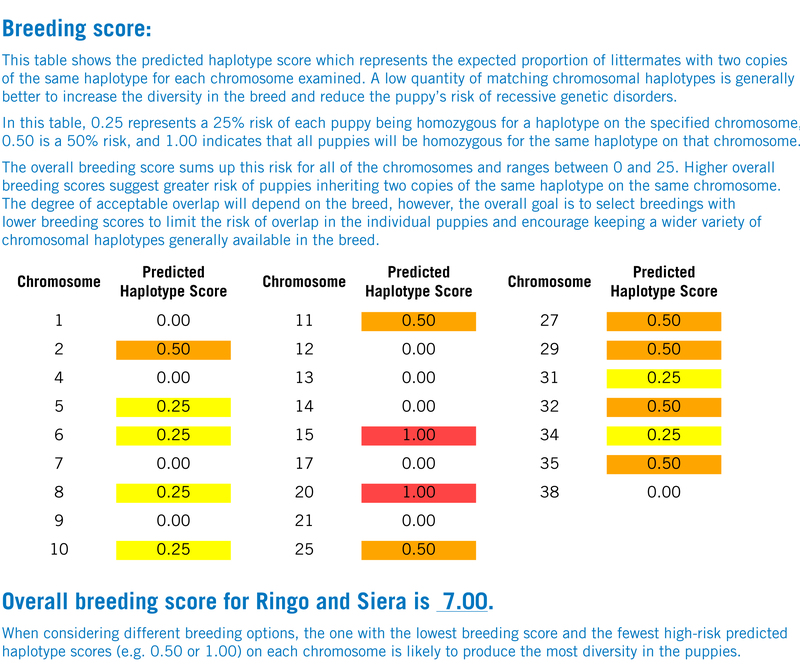 DNA profiling of each puppy for parentage is the only certain method to ensure (where as mentioned below, DNA tests are available) that there are no unexpected health issues. To maintain genetic diversity it is important, especially in a breed with a relatively small gene pool, not to discard carriers of recessive diseases from the breeding pool. A desirable mating is one where the health outcomes for puppies are positive. A carrier can be mated to a normal or even an affected safely, without the offspring having the potential to be afflicted for the disease. However, mating a carrier to a carrier, carrier to affected or affected to affected does have the potential to produce the disease in the puppies and these breeding combinations should be avoided and are therefore undesirable. In the case of recessive disease both parents must carry the disease for it to be produced in the puppies. One can imagine the outcome if that accidental or non witnessed mating was between two carriers. Without DNA profiling each puppy no one would be any the wiser, until that is, a puppy unexpectedly produced the symptoms. Tambuzi provides puppy buyers with proof of parentage – this ensures some certainty and confidence to puppy buyers that (where there are DNA tests available) there will be no unexpected health issues. 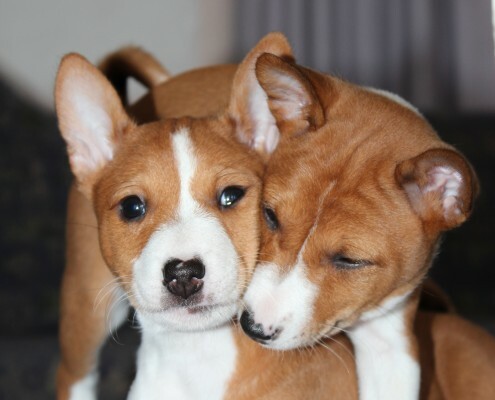 AS PART OF THE COMMITMENT TO BASENJIS AND their OWNERS TAMBUZI PROVIDES A COPY OF THE DNA PROFILE OF a PUPPY to owners. A DOCUMENT that verifies PARENTAGE IS ALSO PROVIDED. These documents provide owners the ability to use the on-line parentage verification software at ASAP’s website. WHERE DNA TESTS ARE AVAILABLE, PUPPY BUYERS WILL KNOW, IN ADVANCE, THE HEALTH STATUS OF THEIR PUPPY. Puppies from this litter will be normal (clear) for Fanconi Syndrome and Pyruvate Kinase Deficiency. Based on probability 50% of the litter may be normal (clear) of PRA-BJ1 and 50% may carry the disease. However, these percentages are a guide only, 100% may be normal (clear) or 100% may carry the disease. It should be noted that carriers only ‘carry’ one copy of the mutant gene responsible for this disease. Therefore, they will not actually become afflicted by it. 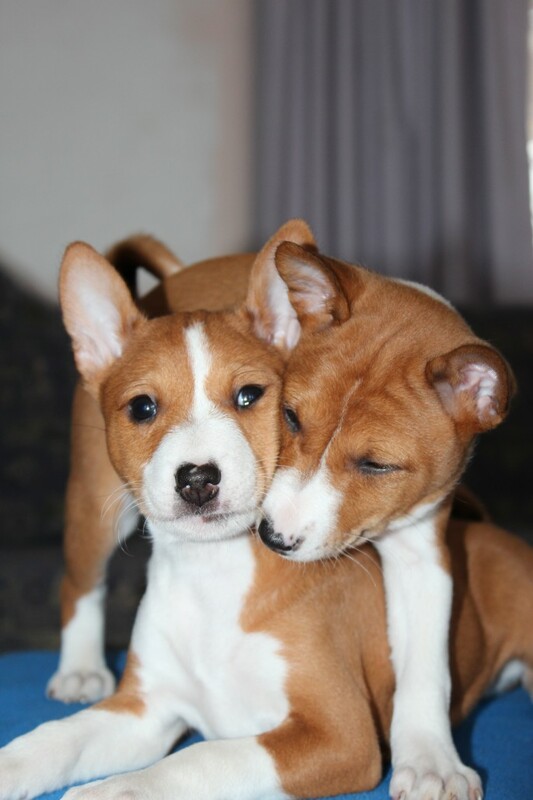 Copyright © Tambuzi Basenjis. All rights reserved.